KEY FEATURES: Spreading tree to 15m. LEAVES compound, paired leaflets; LEAFLETS 8-16 pairs, to 8x3cm, tip acute to rounded. FLOWERS on rigid stalk to 10cm; each on long stalks, 3-6cm; sepals red or green; petals 12-35mm long, pink turning red or pink to white turning yellowish-pink; stamen-stalks 3 long abruptly dilated centrally. 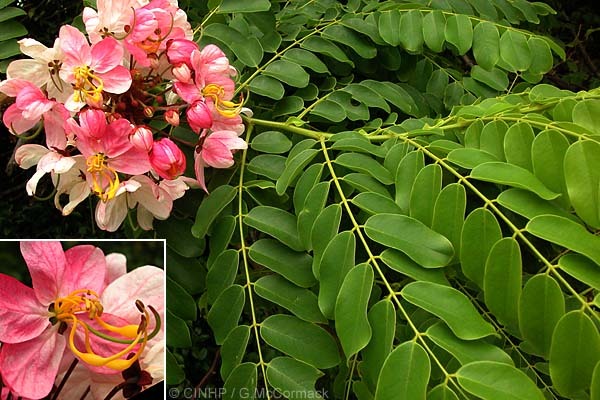 SIMILAR SPECIES: Rose Cassia (Cassia roxburghii has smaller leaflets to 4x2cm (vs. to 8x3cm), flower-stalk shorter to 2cm (vs. 3-6cm), and flower petals shorter to 14mm long (vs. 12-35mm long), and stamen-stalks not centrally dilated (vs. abuptly dilated).